When I was a child, we had a garden. Always a good reason for a garden. A war was on (twice!). Saved money. Eliminated waste of the several fruit trees on various properties. A Queen Anne cherry tree in my grandmother’s back yard translated into cherry pies in the winter. In my grandma’s kitchen, I sat on the kitchen table and turned the handle that spit pits out one side and slid pulp down the chute, into a bowl. I came home from school in the forties and fifties to canning every fall afternoon. I slid skins from tomatoes and peaches and packed them in quart jars. After supper we put on lids and rings, put the jars into the canners and settled down to the Lone Ranger while they processed. I graduated high school in 1961, and went off to college. I can’t say I never canned another tomato. I fell off the turnip truck, very young. When I was married, we lived in Willoughby, Ohio, in a house on Strawberry Lane. I wanted a garden, our landlord did not object, and we made a garden. It was loam to dream of. Twenty years of mowed grass mulch, miles of grass roots, millions of worm tunnels. Perfect, once in a life time soil under the sod. I can’t remember what I planted in the garden, while we lived there. Tomatoes, for sure. Radishes and carrots to die for. They grow perfectly in perfect dirt. And, turnips. I love turnips. I’ve met one other turnip lover in my life, my husband’s Aunt Jean. Aunt Jean and Uncle Leeds lived in California, with their son, Howard, in La Jolla. Aunt Jean was my father-in-law’s sister. I met her and her family once, when they came east to visit. My father-in-law was a reserved man. I never imagined him as anything but a civil engineer, even when he was a child. His mother and I were friends, and Grandma Thomas (she outlived two husbands) had a garden behind her house upstate, but I doubt my father-in-law did more than draw highways in the dirt. My mother-in-law came from the same German green grocer stock background as my mother. Dottie Noragon never really approved of me and certainly shared no childhood memories with me. Her brothers and sisters did, though, and I know Mom Noragon knew turnips, too, even if she never admitted it. So, Uncle Leeds, Aunt Jean and Howard came visiting from California, and stopped to see us. Uncle Leeds wore trousers, an open throat cotton shirt, a Panama hat. Aunt Jean wore a light cotton shirtwaist and sandals. Howard was a young teenager. I walked around the back yard with them, past laundry and a thousand diapers flapping on the line. I was slightly embarrassed; my mother-in-law had a dryer, and I was sure Aunt Jean must, too. And up from the soil one of my perfect turnips. Jean brushed it clean on the hem of her beautiful dress. “Quick, Leeds, your knife!” The turnip turned to slices in her hand and was shared with Howard and Leeds. She went back to my in-law’s home with a bag of turnips, “for Dottie to cook for supper.” No idea how that went over. The picture that inspired the story. About 1966. 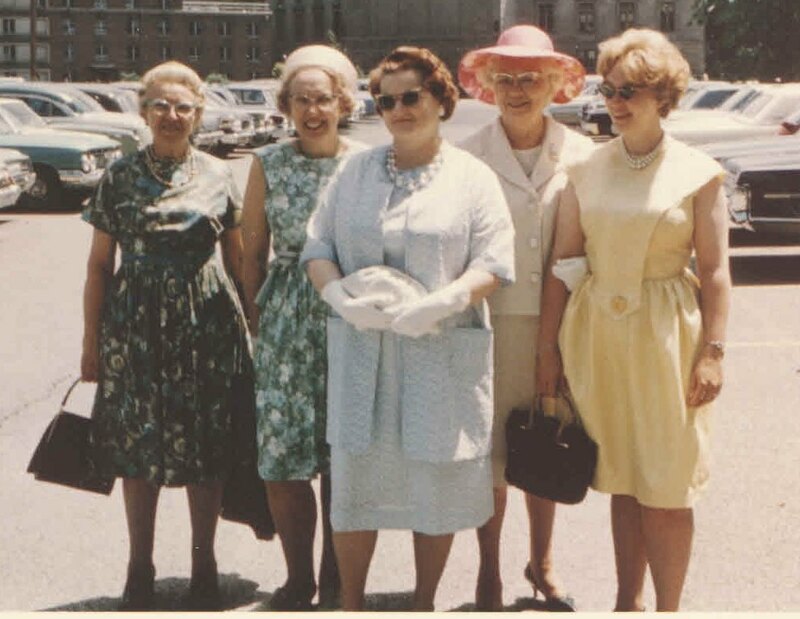 Back row, left to right, my Grandma Rolf, my mother, Lenore Lytle. Grandma Thomas. Me. Front row, my mother-in-law, Dottie Noragon. I loved GrandmaThomas. You can tell by looking, she would have a daughter named Jean, who loved gardens, too. aww, your post made me think of my grandmother and her marvelous garden. You have such a wonderful memory, Joanne. Great story. I love a good garden, but a gardener I am not. It takes patience, knowledge, and good soil...all I have is the soil. I did manage a few nice tomatoes this year. Back when women wore dresses most of the time. I love that yellow dress you are wearing in the picture. Thanks. I made it. Between babies, there. Well, Yam, I looked it all over on google. My turnip looks like your swede, and I cannot find a single picture of a swede that does not look like my turnip or my turnip that does not look like a turnip. Apparently they have melded into one, in half a century. Thank god they aren't kohlrabi in disguise. I don't like kohlrabi. turnips have purple and white skins, swedes have duller purple and yellow skins and are milder in flavour. they don't have the 'bite' of a turnip. Yay, I'm a turnip eater! I love turnip, too - we'll have to start a group. When I was growing up, supper on weeknights was always meat and two veg, on of which was potato, the other was often a root vegetable, especially in winter. My mother would be cutting up vegetables while I did my homework at the kitchen table, and she would always, always hand me slices of raw turnip, cabbage or carrot. I prefer raw to cooked, but eat it either way. And Christmas dinner isn't complete without cooked turnip. Love your story, Joanne. And - wow! - you look like the cat's meow in that dress! What a knockout! and I love that yellow dress you were wearing! You looked pretty darn good in that yellow dress. Bashed neeps...pureed turnips. I loved them and grew them in all my gardens in order to have them fresh and sweet. That is such a stylish dress you are rocking. We always had gardens too. And preserved and savoured. Add me to those who like turnip - and who often prefers her vegies raw. (Carrots and capsicum are poison to me when cooked). Loved your story My Mother-in-law had the greenest thumb, she could grow anything. I'm not a turnip fan. What a great memory! A good one for Laura to keep. Hearing you talk about your perfect soil makes me envious. What I could grow with perfect soil. Umm turnips might be in the garden but not too many, ha ha. I do like a variety of vegetables and some I like more than others. We used to eat turnips. Mom would grow them and mash them up with potatoes and carrots. Looking through my family tree yesterday I discovered my mother's aunt had a green grocer shop in Germany, which explains to me why mum grew a garden everywhere we lived, until she left us. Whenever we visited her after that, there was never another vegetable garden. There was a fruit orchard in one of the places she lived, but it was already established when they moved in. That's a lovely photo of you and your family. I never ate a turnip until I was in my 40s and went to Thanksgiving dinner at a friend's house. and then I was in my 60s before I ever ate them again. I'll get them occasionally now but the cook doesn't really like them. I am a turnip lover but am the only one in the family. I make them for myself every Thanksgiving and don’t have to share. I am a turnip lover also but they grew on me. I didn't like them until I was in my 20s and then, suddenly, couldn't get enough! Salt, pepper, butter and yummm. I love the photo-the photos somehow connect everything for me. I love this story. Both my husband and I loved turnips. I loves them boiled and served with a lot of butter with salt and pepper. My mom mashed them like potatoes. Oh it's making my mouth water for a turnip. I have a great turnip story. I should share it on my blog soon.